The red marks on this heatmap from DownDetector.com indicate complaints about Comcast service as of dinner time on Wednesday. Two days after Comcast experienced a widespread outage of its pay-TV service, the nation’s largest cable company has acknowledged that it is once again looking into complaints of no TV service for customers all over America. UPDATE: Comcast is publicly apologizing to affected customers, saying the problem occurred during an upgrade to the company’s X1 platform. No word on whether subscribers will receive bill credit for the outage. The heatmap above, taken from DownDetector.com at around 6:20 p.m. ET today, shows a large number of complaints from all the major markets served by Comcast, including Boston, D.C., Philadelphia, Chicago and many other metro areas. Notice that gap of not-red just to the right of the final “A” in “PENNSYLVANIA”? That’s the New York City market, which Comcast is currently trying to bring into the red by spending more than $40 billion to acquire Time Warner Cable. 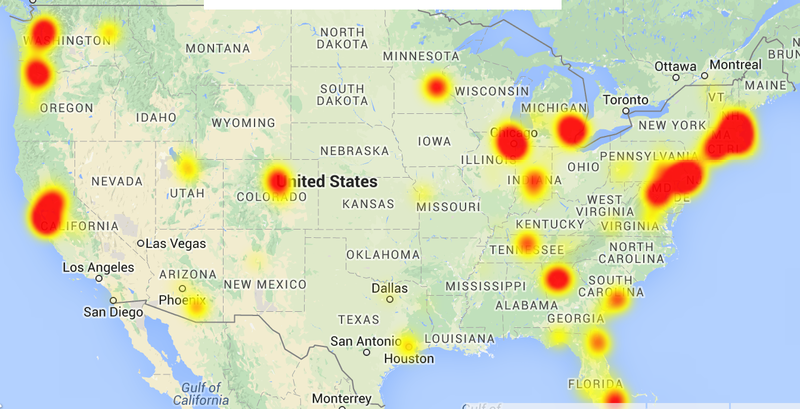 We’ve also reached out to Comcast HQ to see if there is a more formal statement regarding the outage. We’ll update if and when we hear anything back.